It’s our opening match for Weatherlight as we’ve rounded the bend on Project Mirage Block. Joining me at the table today is Jimi, who is braving back spasms to make sure the decks get tested and shipped on-time. Assisting her endeavour is Gatecrasher, Weatherlight’s Green/Red beats deck, and here’s how the afternoon unfolded. Jimi’s on the play, and leads with a second-turn Rampant Growth to accelerate her manabase, while I’m doing it the old-fashined way- one land at a time. Once turn 3 rolls around, she then brings out the game’s first creature, a Bogardan Firefiend, which I match with an Ophidian. Next turn she then plays an Uktabi Orangutan, putting my artifacts on notice after a 2-point attack with the Firefiend. Back to me, it’s a defensive shore-up with the Heavy Ballista. Now turn 5, I go down to 16 from another Firefiend attack, which Jimi follows with Stampeding Wildebeests. Luckily, I manage a Waterspout Djinn to keep things on an even keel. Jimi has other ideas, however, and after returning the Orangutan back to hand (thanks to the Wildebeests), she places a Fire Whip on her Firefiend (fittingly enough). Then she turns her Firefiend and Wildebeests sideways, and after some quick calculations I orchestrate a four-way swap. My Ballista and the Firefiend trade off each other, while the Wildebeests and Djinn cancel one another out. To top it all off, Jimi sacrifices the Whip to ping me for another point of damage. While surprised at her losing the whip so cheaply, her reaction to the all-around block suggests she thought I wouldn’t take the trade, a miscalculation I hope to turn to my advantage. Down to 14 life (as a point of trample damage came through overtop the Djinn), I watch Jimi play a Wall of Roots before passing the turn over. I swing with the Ophidian, which she blocks with the Wall, then play a Mistmoon Griffin. With the Djinn on top of my graveyard, I’m hoping the Griffin finds a good reason to die relatively soon. Jimi repopulates her side of the table with a pair of Llanowar Sentinels, one from hand and the other from her library. My turn is a blank, with only an Island to show for it. Next turn Jimi plays a Cone of Flame, killing my Ophidian and Griffin, and doing a point of damage to me. I send the Griffin to the graveyard first to bring the Djinn back, so it’s not a total loss overall. Back to me, I then pop an Island back to hand and replay it in my main phase to keep the Djinn up, then deploy a Suq’Ata Firewalker. A brief aside here- I got the call wrong on this, something that I didn’t note until after the game had run its course. There were two options I used to check the leaglity of the return-the-DJinn move after the fact, a tweet to @CranialTweet and then the official Wizards MTG judge chat room. I got an answer from the latter within about a minute, from user Natedogg2: “After the Cone has resolved, state-based actions are checked and the Griffin and the other creature die. Then the Griffin’s ability goes on the stack. 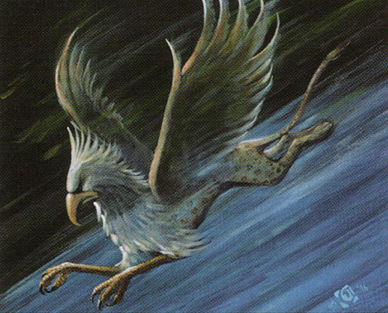 Since the other creature will be in the graveyard above the Djinn, the other creature will be the one returned by the Griffin’s trigger.” I post this here as a notice to others who might not know that it exists, though as we’ll see it had little practical impact on the course of the game. Now turn 9, Jimi sends in both Llanowar Sentinels for 4, keeping the pressure up. I chew one up with the Djinn, going down to 13, then see her replace it with a Llanowar Behemoth. Back to me, I toggle an Island as I’ll continue to do, then bring out an Ophidian. Next turn Jimi drops her hand, laying in quick succession a pair of Walls of Roots and the Uktabi Orangutan. She then attacks with the Llanowar Behemoth, a 4/4 which could easily become a 9/9- a fact which seals the fate of my poor Ophidian which gets shoved in the Behemoth’s path. I then use the Firewalker to ping Jimi at the end of her turn, the first bit of damage I’ve managed to land. I follow that up with a pair of Serrated Biskelions. Jimi adds to her head count on turn 11 with Striped Bears, attacking in with the Behemoth. This time I chump with the Firewalker, tapping it after blocking for 1 more point of damage at Jimi, though at this point the game’s outcome is a foregone conclusion. My Biskelions both chump and weaken the Behemoth but can’t kill it fast enough before dying themselves, and while I’m able to Memory Lapse Jimi’s Maraxus of Keld, that just means he arrives one turn later. Faced by attacks from both Maraxus and the Llanowar Behemoth (which strike a very interesting fluidity with one another), I play chump blockers until then chumpers run out, and then I do as well. Jimi and I trade land drops which again accelerate in her favour with a second-turn Rampant Growth before I bring out a third-turn Serrated Biskelion. Jimi wastes no time Incinerating it, then adding a Wall of Roots to her board. Sadly for me, my turn 4 is a blank (though I do hit my land drop), while she brings out another pair of Llanowar Sentinels. Still, all is not lost as I summon my Heavy Ballista on turn 5, though Jimi has an even more productive turn- Striped Bears and a Dragon Mask after a 4-point attack with the Sentinels (aided with a drop of mana from the Wall of Roots). Now turn 6, I play an Island and pass. Jimi presses on, swinging for 6 with the Sentinels and Bears. I use the Ballista to kill the Bears, though as expected Jimi saves them with the Dragon Mask. 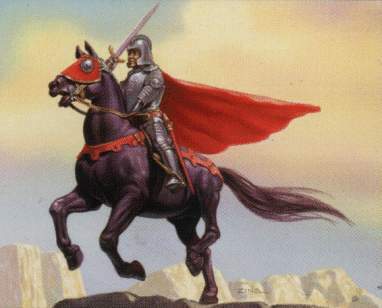 Undaunted, I respond with a surprise Benalish Knight and the Bears are lost. Still, I take 4 damage, and Jimi then brings out her third Llanowar Sentinel. Back to me, I play a Mistmoon Griffin and pass, while she continues to have momentum on her side. Another 6-point attack cuts me in half, then she adds the Aboroth. I “solve” the Aboroth on turn 8 with a Pacifism, though it’s purely a stalling measure- all Jimi needs to do is bring it back with the Dragon Mask and she’s free to replay it, but I’m running out of options. Back to Jimi, after paying the Aboroth’s cumulative upkeep she swings in with her trio of Sentinels for 6, forcing my hand. I block one with my Heavy Ballista and Griffin, then tap the Ballista to throw some damage towards a second Sentinel which I’m also blocking with my first-striking Knight. Jimi responds by using the Dragon Mask to kill off my Ballista and keep at least one of her blocked Sentinels alive, though I similarly retain the use of my Ballista with a timely Debt of Loyalty to regenerate it. The other Sentinel gets past my defenses, and I’m now down to 4 life. Jimi replaces her loss with an Uktabi Efreet and ends her turn. Now turn 9, all I can do is play an Ophidian. Jimi opens by tossing a couple more -1/-1 counters on the Aboroth, then attacks in with the Uktabi Efreet for 5. I block with my Griffin, letting me fetch back the Biskelion, though after throwing on a couple more points’ worth of damage from the Ballista Jimi simply activates the nettlesome Dragon Mask to save it and return it to hand. She then replaces it with Arctic Wolves and passes. Although I draw a respite with a Waterspout Djinn, Jimi brings the game to an abrupt end when she draws a Kaervek’s Torch, burning me out. Aside from the obligatory early land drops, the opening play of the game is Jimi’s second-turn Wall of Roots, which immediately enables her to add a Granger Guildmage alongside it. Next turn I bring out a Vodalian Illusionist, while Jimi misses her land drop and is forced to tap her Wall of Roots to deploy a Dragon Mask. Now turn 4, I then add an Ophidian, encouraged at Jimi’s early struggle with her mana base. She misses her next land drop, settling for enchanting the Guildmage with a Fire Whip. Back to me, I use the Illusionist to phase out Jimi’s Wall, letting my Ophidian swing in for a free card. At the end of my turn, Jimi pings me for 1. This time she draws a land- a Forest- and passes after playing it. Sensing opportunity, I deploy my Waterspout Djinn on turn 6, hoping to catch Jimi without a playable answer given her early struggles, but it’s not to be. She blows me out with a Cone of Flame, hitting the Djinn for 3, the Illusionist for a lethal 2, and throwing the last point of damage at my life total. This lets her finish off the crippled Djinn with a ping from the Granger Guildmage. So thwarted, I replace the Djinn with a Mistmoon Griffin, while Jimi’s turn is a blank. Now turn 8, I swing in for 2 with the Griffin before adding a Serrated Biskelion to the board. Jimi pings me at the end of my turn, and I go down to 17. She also equips the Dragon Mask to her Wall of Roots, looking to return it to hand to cast afresh. Replaying the Wall is the only play she has open, so after doing so she ends her turn. My turn 9 is a blank, and Jimi next brings out a Llanowar Sentinel. At the end of her turn, I flash in a Benalish Knight, feeling that I’ve hit the tipping point where I need to assume the role of the beatdown and finish Jimi off before she can stabilise. I begin turn 10 by killing off her Granger Guildmage with a hug from the Serrated Biskeltion, but it’s a Pyrrhic victory- she pings the Biskelion in return, then pops the Fire Whip to throw another point of damage at me. I next bounce her Wall back to her hand by summoning a Man-o’-War, and steal her Llanowar Sentinel with an Abduction. This lets me send in my Knight, Griffin, and Ophidian unopposed, nicking Jimi for another 4 and drawing another free card. Now at 14 life, Jimi next trots out the Arctic Wolves and passes. Next turn I attack in the air with the Griffin, then land the Heavy Ballista. Back to Jimi, she first plays the Wolves’ cumulative upkeep, then attacks with them, adding in some Dragon Mask damage for good measure. The Wolves return to her hand at the end of turn, freeing her from the cumulative upkeep and offering the prospect of another free card. Now turn 12, I swing for the fences with everything. Jimi blocks the Llanowar Sentinel with her wall, then goes down to 4 life while I draw a free card. For her part, Jimi summons a Redwood Treefolk and passes. I keep the pressure one, throwing almost everything I have across the table (though I keep the Sentinel back so that Jimi can’t kill it and see it return to her). Jimi Incinerates the Griffin, bringing back my Serrated Biskelion, then uses her Wall and Treefolk for blocks. When the dust settles, she’s down to 2 life and needs to land at least a couple of creatures to stay upright. It’s all for naught, however, as once again she finds her Kaervek’s Torch, burning me out a second time for the win. We all have certain deck styles that we enjoy, and for me Blue//White Skies is not amongst them. That said, in our assessment of the deck there appeared to be enough tricks and interactions in the deck to make it deviate enough from the stock archetype to be enjoyable. In practice, this might have been a bit overdone. I seemed consistently unable to find real solutions to the problems Jimi’s deck posed. In fairness, some aspects of Gatecrasher are well suited towards putting Air Forces off its game. For one thing, it didn’t field a lot of 2-toughness-or-less creatures, which would allow me to either deter them outright with the Heavy Ballista or two-for-one the deck with a surprise Benalish Knight. In addition, Gatecrasher’s ability to return its creatures to hand (either with the Dragon Mask or Stampeding Wildebeests) reduced the impact of my auras. Pacifisms were nearly useless (Jimi ignored the one I put on her Aboroth, content to return it at her liesure before its own cumulative upkeep killed her, only as it turns out she killed me first), and I had to time my Abduction for when she was tapped out and unable to trigger the Mask in response. All this isn’t to say that Air Forces is a poor deck, for there were a few options I never draw that might have helped. Empyreal Armor would have been especially welcome on my Mistmoon Griffin, particularly when the Waterspoud Djinn ensured that any land drawn just sat in hand for awhile. Any of my larger options like the Alabaster Dragon or Cloud Djinn would have been nice as well, though the Djinn’s inability to block on the ground would have been distressing given my deck’s position as a more control-focused construction. Overall, it just didn’t quite feel like there was enough meat in Air Forces, and that it was unbalanced to favour a bit of style over substance. It struggled quite a bit against what seems to be a pretty straightforward creature deck, and failed to find enough ways to contain the board. These might have been evened out by landing some flying creatures to help me get in for damage while the ground was congested, but less than one-third of the deck’s offerings actually fly.